Gaius Valerius Carbo has returned to the heart of the Empire after 25 years serving in the legions. He just wants to retire in peace. But his friends are gone, his family are dead, and his home now belongs to someone else. When local thugs attack the tavern where he is resting, he finds himself caught up in the fight, and inadvertently becomes the new owner of the building – and the enemies that come with it. His world is turned upside down when he is confronted with a face from his past. He had sworn to protect and look after his childhood friend Rufa after her father died alongside him in battle. But now she has been sold into slavery, and is on the run from her mistress, Elissa. Elissa is a powerful priestess who is organising a cult to try and destroy Rome from within. Can Carbo protect Rufa – and Rome – from Elissa’s evil plan? 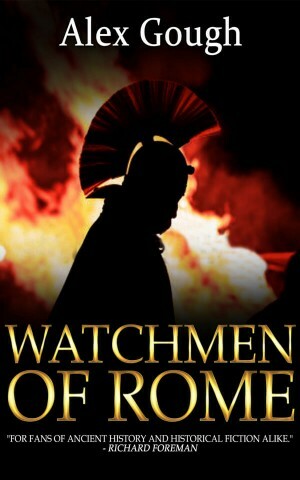 Or will her following be too strong for the Watchmen of Rome? Richard Foreman, author of the bestselling ‘Swords of Rome’ series. It’s a superb piece of work. Excellent characterisation, great action, lovely attention to detail, storming plot and a really nice ending. SJA Turney, author of the Marius Mules series.